Facebook has shut down Facebook Lite - but insists that the experiment was a success. Facebook Lite, launched last year, was designed for those with poor connections, offering a pared down service. Anyone trying to access the Lite version will now be redirected to full fat Facebook. 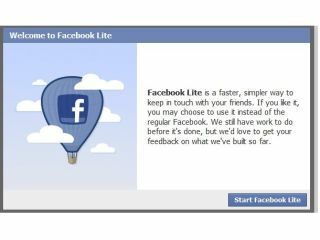 "We're no longer supporting it, but learned a lot from the test of a slimmed-down site," read a post on the Lite Facebook fan page. Speculation about exactly why Lite was finished is rife, but Facebook has remained closed lipped so far. Of course, it could well be that with phone versions and better connections proliferating, there simply wasn't enough demand for a reduced service. We'd ask if anyone here was upset, but we never got round to TechRadar Lite so you probably can't even read this.